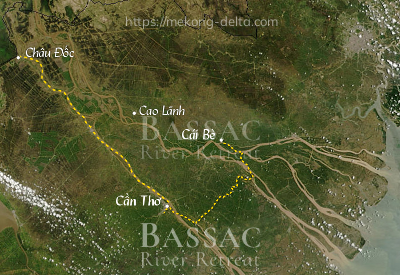 Enquire or book a trip along Cao Lãnh - Châu Đốc - Cần Thơ - Cái Bè. Boarding at Cao Lanh at noon, welcome drink, introduction to the ship and crew, checking into the cabins. Boarding at noon at the Chau Doc pier, welcome drink. Boarding back, complimentary drink as a welcome back on board. Rest on the deck or around the bar enjoying the sunset. 06:00 Departure towards Cai Be. The passengers take their breakfast at 7:00 while enjoying the scenery on the banks. Arrival near Cai Be, check-out and transfer to a rowing boat for a quiet visit through a small canal if the tide allows.